Ever wondered what New Year’s food looks like around the world? Surprise surprise, it’s not all BBQs and beers, canapes and champagne. In fact, New Year’s food around the world looks a lot like manifesting prosperity, good fortune, and shedding the bad energy of the past year. Not too bad, hey? If you wanna try your luck at bringing in good fortune for the next year, try something a little different this NYE and give one of these international New Year dishes a try. It’s no ordinary New Year in South Korea. Celebrated on January 28, New Year is also the day that everybody in the country turns a year older. That’s right, NYE in South Korea is just one huge birthday party. And the most common dish you’ll see eating at that time is tteokguk, a rice cake soup that can also be topped with eggs, roasted seaweed, green onions, and shredded brisket. This dish has been consumed in Korea since ancient times, especially in religious rites and ceremonies. 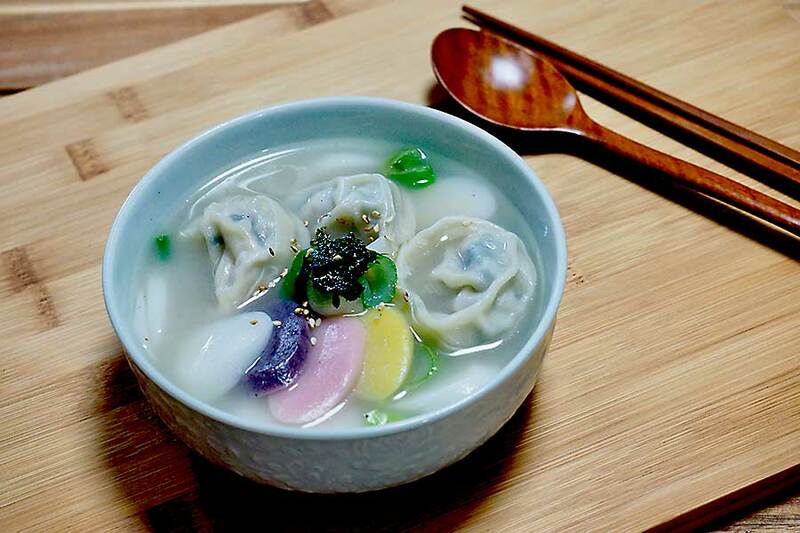 It’s like the birthday cake of South Korea – in fact, it’s been said that you can even guess a person’s age by asking them how many bowls of tteokguk they’ve consumed in their lifetime! No, we’re not talking about ham glazed in a thick layer of sweet syrup. In Germany, pigs are considered to be a symbol of money and fortune (sounds appropriate, doesn’t it?) The good news for vegetarians is that you don’t have to chow down on pork and ham to get your fix of good fortune on New Year in Germany – instead, go for a glucksschwein, a tiny little pig dessert made from sugar and almond paste. A sweet pig brings in a sweet New Year! If you fancy some good luck for the next year, try the Spanish tradition of eating 12 grapes on New Year’s Eve. Practised for at least a century, it’s thought that this tradition started in 1895 when there was such a huge abundance of grapes that the King of Spain distributed them around the country for the New Year. You don’t just eat the grapes any which way, however. You’ve gotta eat one grape for each strike of the clock at midnight, so be quick! Some people even prepare their grapes beforehand, peeling and seeding them for quick consumption. Sweet grapes signify sweeter luck, and sour grapes not-so-sweet luck. Try your luck this year! The worst that can happen is that you’ll have eaten 12 grapes, and your luck remained the same. 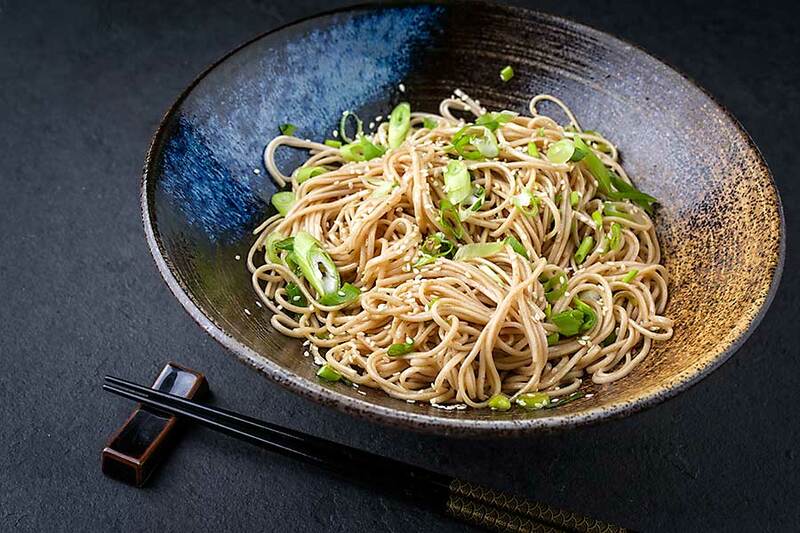 Slurping on these tasty buckwheat noodles is a Japanese tradition that dates back around 800 years. The dish symbolises good fortune and releasing energy from the past year so it doesn’t carry on into the next. How so? Well, the soba’s firm bite makes them easy to break while eating – thus breaking off energy from the last year – and their length symbolises a long and healthy life. But don’t eat Tokikoshi soba during the midnight hour! The crossover between the past year and next year is not complete, and you may risk carrying on energies into the new year. So when should you eat them? In some regions, they have the Toshikoshi after New Year’s celebrations are well and truly over, while others believe the best time to slurp them up is while the NYE bells are ringing in the shrines and temples. Today, it’s a New Year’s custom in Greece to smash a pomegranate on the floor of the entry to your house. When the pomegranate splits open, it’s seeds are revealed – symbolising prosperity for the next year. Hear hear! Note: Pomegranate smashing doesn’t only happen in Greece, but across the way in Turkey as well where it’s celebrated for much the same reason. There must be something behind it! The Chinese Lunar New Year is a massive two-week celebration that culminates in the Lantern Festival on the 15th day. 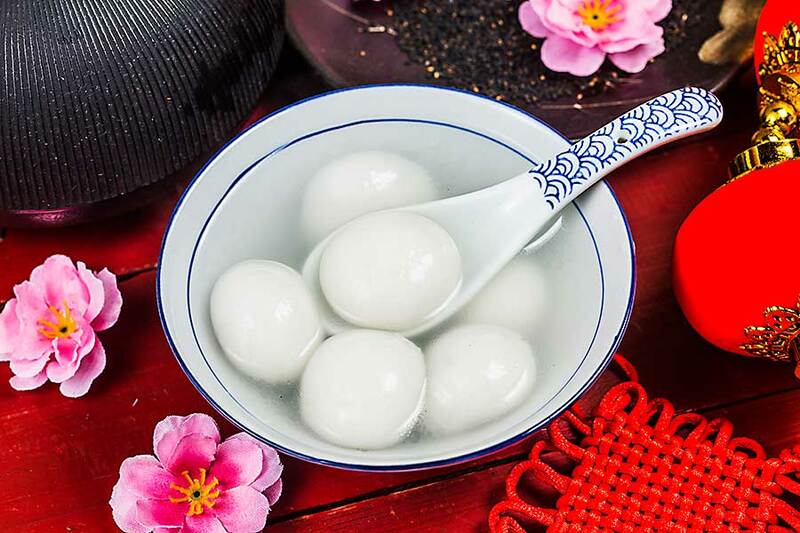 And you can’t celebrate the Lantern Festival without tang yuan. Made from sweet rice dumplings stuffed with fillings like black sesame paste, sweet bean, or sugar, nuts, and fruit, and drizzled with sugar syrup, the round shape of the dumplings symbolises union, wholeness, and togetherness (you’ll also see it served at weddings for this same reason). Some people dye the dumplings pink or red, representing good fortune and happiness for the coming year. In another nod to bringing in good luck and prosperity, Italians eat lentils during the New Year period as a symbol of fortune. The round shape of lentils has been linked to gold coins since the time of the Romans when they were even given as gifts in place of actual coins. The Romans would exchange leather bags of lentils, which would be tied to their belts to attract an abundance of good fortune. These days Italians don’t hand out lentils but rather eat them, usually on New Year’s Eve as part of the social gathering and then again for lunch on New Year’s Day. Feel like putting a cultural spin on your New Year’s party this year? Be fed like a local with our Taste of the World culinary catering journeys.